My name is Lee MacDonald, I have owned and run Mentor Lock for over 17 years now and I pride myself on customer satisfaction. Even during my many years on the BBC's Grange Hill where I played the part of Zammo I was working as a Locksmith and eventually took over Mentor Lock in March 2000. Please feel free to call the shop on 020 8669 7034 if you have any questions or queries regarding lock changes or upgrading your current locks. So pleased with the service from Mentor Lock. Lee and Andy couldn’t have been more helpful, friendly and efficient. Will be recommending to everyone. I have rarely encountered such fantastic personnel service. Nothing was too much trouble. Our lock fitting was sourced and fitted speedily and efficiently and Lee's charges are extremely reasonable. He even came after work to check the fitting then went back to the shop to cut extra keys at no cost to us. This really is going the extra mile and I wouldn't hesitate for one second in recommending Mentor. Needed to get locks on house changed after a tenant eviction. Lee is a very genuine and decent guy - gave a ball part figure which was spot on. Just labour and the cost of the locks. No call out fee. Phoned him in the morning, job completed by the afternoon - so efficient. Very difficult to trust tradesmen these days - how wonderful to come across someone who is so genuine, approachable and honest. Would highly recommend and will use again. Thanks Lee at Mentor Locks. Two rack bolts and a new British Standard cylinder lock fitted following an attempted break-in on glass double doors. Lee and his colleague Andy were very quick and efficient to respond to my request, to assess what was needed, and to deliver a friendly and high-quality service. 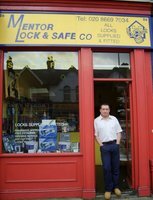 I am happy to highly recommend Mentor Lock Ltd.
Mentor have been our sole supplier of locks and lock smith services for many years. Over this time they have advised, supplied, and installed over 100 locks for us, as well as installing commercial code locks and fast response lock smith services when keys have been lost, or locks have failed. I had five door lock replaced by this company and was happy with the job they did. All has been okay and there have been no remedial issues. I already recommend them to others. I had a safe fitted and a Yale lock replaced on my front door. They are a trustworthy company and the service is polite and prompt. I have already recommended the business to others. I had an emergency lock replacement after I lost the keys to my house . The business were efficient, helpful and quick to solve the matter. I have kept Lee's number and will be sure to phone him again if I ever need any locks replacing. I would happy to recommend their service to other people. We lost the key to our garage and decided to have the old lock replaced by Mentor Lock and I thought that they were an excellent business. They turned up on time and Lee was so helpful when I spoke to him. I always recommend them to other people. I needed a faulty lock to be repaired. Both the person I spoke to on the phone and the person who attended were polite and friendly. I was kept informed of when the locksmith would arrive. The locksmith attended quickly and fitted a new lock swiftly. Would be happy to use this company again.